The Rochester <-> Toronto Ferry is no longer operational! In August, we decided to visit family in Long Island, N.Y. and once again took The Spirit of Ontario, The Breeze, fast ferry to Rochester, this time with our car. It was a bright, sunny day and the trip across the sparkling Lake Ontario was calm and relaxing in the comfort of the aft lounge. There was a full contingent aboard including many families, pleased with the two movie theatres and play areas to entertain the children. Judging from the conversation around us many were heading to the Finger Lakes Region. It took about an hour to clear customs and immigration in Rochester because there were not enough stations open to process the number of vehicles. It was the same situation when returning to Toronto. However, we knew that if we were driving, crossing the border would not have taken less time, perhaps more. We had decided to overnight in the Finger Lakes Region in Aurora. On the way back we would stay in Rochester before taking the afternoon ferry to Toronto the next day. The Finger Lakes takes its name from the eleven thin parallel lakes that spread across the region like a huge handprint. We took the New York State Thruway east to exit 41 and proceeded south. It was a glorious drive through rolling hills, vineyards, farmlands, and lush valleys, with clear blue Lake Cayuga never far away. 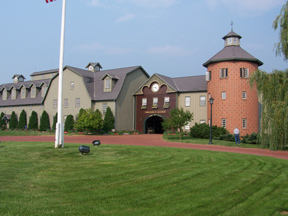 Wineries abound and for those so inclined, a wine tour is the way to go. Nestled into this peaceful and captivating landscape are sweet towns and villages boasting excellent accommodations and eating experiences. A prime example of this is the Village of Aurora and The Aurora Inn and Lakeside Restaurant. The village of Aurora is centered on Main St. (Rt. 90) which borders Lake Cayuga, a picturesque setting. Thanks to the Aurora Foundation, a partnership between Wells College, the small, women's liberal arts college in Aurora, and the Pleasant T. Rowland Foundation, Aurora has had a rapid reversal of fortunes. The Aurora Inn has recently reopened after a multimillion dollar restoration. Next door is a uniquely stocked Village Market and across the way the Fargo Bar & Grill and Pizzeria with Pizzazz are favorites of locals and tourists. Since we had our lunch on the ferry hours before, we were in desperate need of an ice cream fix. We found Dories, a few blocks south, where we sat on stools at the soda fountain bar and enjoyed large scoops of delicious, creamy flavors. This delightful shop offers table seating inside and outdoors with lovely lake views. Besides soda fountain favorites, there's a selection of sandwiches and fresh baked pastries, muffins and breads. There's also a nice variety of gift items and candy to choose from. Before checking into the Aurora Inn we headed back north on Main St. to the home of the world famous maker of hand-crafted tableware and furnishings, MacKenzie-Childs. The manufacturing studio, retail shop and restaurant (scheduled to open Spring 2005), sits high on a bluff above the lake on a former 75 acre Victorian dairy farm. Highland cattle graze in the fields and you can enjoy the gardens, greenhouse and Chicken Palace (home to ducks, chickens and guinea fowl.) We were too late for the last tour of the studio to observe the artisans hand crafting, hand painting and hand trimming each gorgeous piece but a walk through the retail store was more than enough eye candy to enrich the day. The colorful designs and craftsmanship are a joy to behold. Here in the store, the gifts we purchased were beautifully wrapped at no additional charge. The Federal-style Aurora Inn with its white pillars, long white decks and manicured lawns is a portrait of the perfect country inn. Upon entering, you immediately sense it will be difficult to leave. 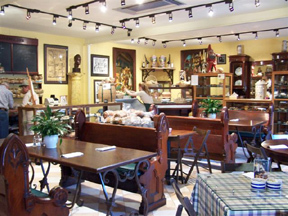 The reception and parlor are graced with attractive antiques and fine art. Exquisite furnishings, oriental rugs, four fireplaces and rich woods create delightful warmth and a feeling of understated elegance. The smartly-designed lakeside restaurant and lounge makes one feel comfortable in either casual or dress attire. This is a place to relax and enjoy. The exterior deck beckons those who choose to drink and dine in the splendid Finger Lakes outdoors. The King Suite is on the attic level with magnificent lake views from the bedroom. The well-equipped sitting room leads to a very large king-bedded bedroom with a large plasma TV. The mattress, pillows and bedding are of the best quality, superbly comfortable. The in-room kitchenette with wet bar, refrigerator and microwave offer great convenience, when needed. The bathroom was huge with a deep-soak whirlpool bath with skylights for romantic star gazing. The large stall shower, thick terry towels and bathrobes and fine quality personal products added to the comfort factor. We enjoyed a leisurely cocktail in the lounge and had the pleasure of chatting with a resident of the area who convinced us to visit the Village of Skaneateles on the lake of the same name on our next visit to the region. We chose to have our dinner indoors, at a table by the windows. We started with superb seafood chowder that was rich in texture and flavor, New England style with seafood and cream. Linda's scallops were very fresh large beauties, beautifully grilled and tender, but too heavily doused with garlic for her taste. I had old fashioned pot roast. Two huge chunks of potted meat in delicious gravy were served with a marvelous assortment of roasted vegetables. I could not clean my plate so Linda did not allow me to have the chocolate chunk bread pudding. Lighter on the garlic and it would have been a perfect meal. We took advantage of the complimentary in-room coffee service before our early morning departure. We would have enjoyed staying longer. In 2003 we discovered the wonderful Heidelberg Bakery in Herkimer, N.Y., and resolved that we would never pass by Herkimer without stopping and stocking-up on these extraordinary breads. Returning from Long Island, we exited the thruway at Herkimer and bee-lined to the bakery. What a nice surprise awaited us! Since our last trip they had enlarged and redesigned the premises to include a cafe/eatery - what perfect timing! We shared the daily special of grilled veal steak and rosti and a fresh roast turkey sandwich, both outstanding. While eating, we feasted our eyes on the pastry counter and since we had never indulged in their pastry delights decided the time had come! We shared a mixed berry scone and what they called black bottom, a dark chocolate cake bottom infused with rich chocolate fudge topped with creamy cheese cake, to die for. We left with 10 loaves of assorted breads for our ready and waiting freezer. We returned to the conveniently-located The Clarion Riverside Hotel, a big hotel with small town ambiance, on the banks of the Genesee River. Though our last stay was in June and this was August, the young woman at the front desk recognized us at once as having stayed there before and even remembered our name and looked up our reservation without us even saying a word other than hello. As last time, the quality of service during our entire stay was exceptional. We especially appreciated the complimentary amenities we received when we called housekeeping to request the offered business essentials. We discovered that Rochester is a gateway not only to the Finger Lakes but also to the NYS Seaway Trail. This trail is a 454 mile scenic route paralleling Lake Erie, the Niagara River, Lake Ontario and the St.Lawrence River. "The Breeze" is leading us to new treasures. Contrary to popular belief, Rochester has a lot to offer the visitor. At the web site, you can find sample itineraries along with lots of useful and helpful information. Rochester is divided into diverse neighborhoods each with its own history and character. There is lovely green space and parks for walking and relaxing. There are historic homes and buildings, museums and art galleries. Restaurant choices abound as well nightlife and theatre. While the downtown core struggles to find a new identity, it is home to some wonderful architecture. We were captivated by the historic City Hall on Church St. Its history is quite remarkable. From 1817-1875 it was a tavern then courthouse and city hall. From 1883-1891 it was a federal building. From 1972-1978 it was reconstructed and restored to become the present City Hall. It was originally L-shaped. The new design squared the building creating a marvelous center atrium with distinctive marble pillars and arches and a splendid glass ceiling. As we walked, we were thrilled by the architectural diversity and beauty we encountered. The 1913 renaissance Eastman Kodak building, the 1930 art deco/art moderne Time Square Building with its distinctive aluminum wings on high, the 1968 International Xerox Tower, the 1973 Chase Tower with its white vertical fins, the 1976 modern First Federal Plaza, the 1995 post modern Bausch & Lomb Place, the 1999 modern One HSBC Plaza. And let us not forget the old city hall and clock tower, built in 1875 of Lockport gray limestone in a combination of Romanesque and Ruskin design. The urge for those crispy tender spare ribs at Dinosaur was overwhelming but the repeat performance was underwhelming. The pork was stringy and chewy and the finish was moist without the crispness. To be great, you have to be consistent. On the bright side, the mashed potatoes were fine. Guess we'll have to go back to Amsterdam after all. Before boarding The Breeze ferry to Toronto, we stopped at Abbott's Frozen Custard. I was in heaven with the basic vanilla rendition. Linda tried the fat free dark chocolate that was a big zero. Stick with what made them famous. We continue to learn about our neighbors to the south. Next summer, we hope to expand our knowledge. The ferry ride back was as comfortable and carefree as always.